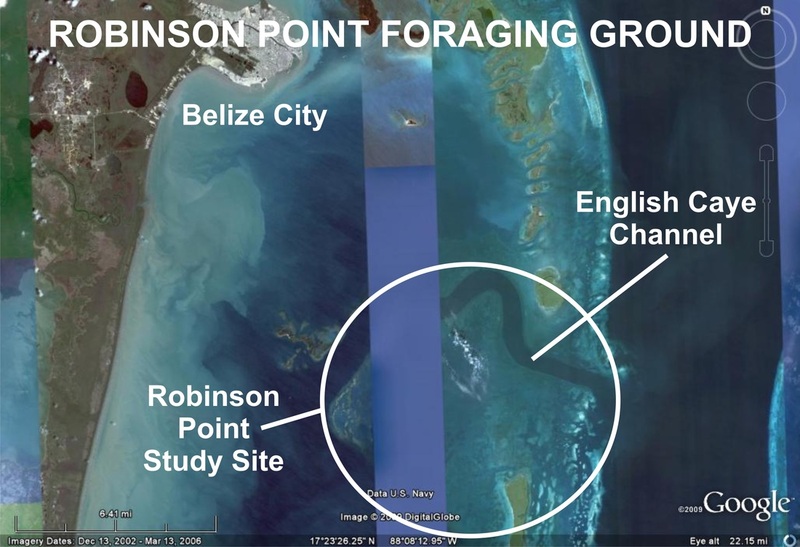 Our research at Robinson Point has been fired by a desire to provide evidence on the importance of this area for migrating adult sea turtles in the Caribbean, and to establish the first marine protected area in Belize solely for the protection of sea turtles. Supporting evidence on the importance of Robinson Point for migrating sea turtles stems from several sources. Tracking the migration paths of sea turtles via satellite telemetry has been extremely important to confirming the importance of Robinson Point as an adult feeding ground. 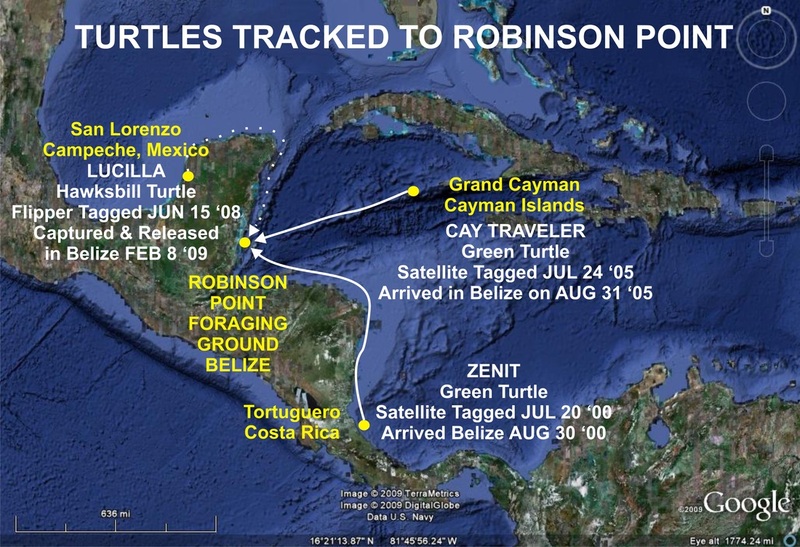 In 2000 a satellite transmitter was affixed to Zenit, a green turtle that nested at Costa Rica, and in about 35 days swam 1500 miles to her foraging ground at Robinson Point, Belize. 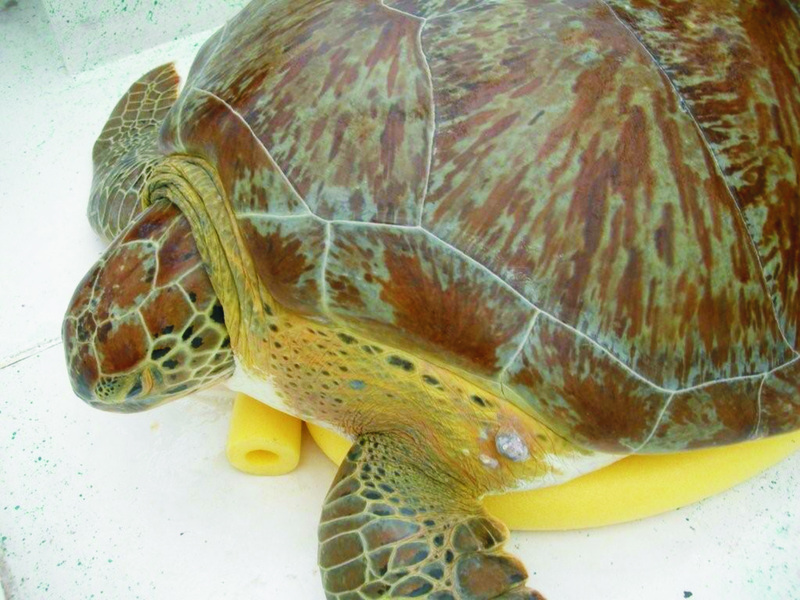 In 2005 a satellite transmitter was affixed to Caytraveller, a green sea turtle that was actually raised at the Cayman Islands turtle farm, nested there, then migrated to her foraging ground at Robinson Point. Flipper tags have also contributed greatly to our knowledge on the importance of the Robinson Point area as a foraging ground for migrating sea turtles. Fishermen interviewed had provided anecdotal reports of finding and returning metal flipper tags to the Sea Turtle Conservancy, formerly Archie Carr's Caribbean Conservation Corps (CCC), for a reward. The Sea Turtle Conservancy reports there have been 25 tag returns from Belize over the past several decades. ECOMAR has asked for their help in identifying links between the two countries and will be examining the details of these tag returns. In 2010, Noel Eiley, turned in a metal flipper with #70553 to ECOMAR for the reward offered by CCC, reporting he had taken it off a turtle that had gotten caught in a gill net at Robinson Point. Upon checking with the Sea Turtle Conservancy, we learned that this turtle received this tag on July 25, 1997, and while she had been observed nesting again that year, they have not recorded her nesting on the beach since then. Thirteen years later however, she was encountered in her foraging ground at Robinson Point. Between 2000-2001Belize City fish markets were visited daily to record sea turtle landings. During this period we learned that many of the turtles sold at Belize City fish markets were harvested from within the Robinson Point area. 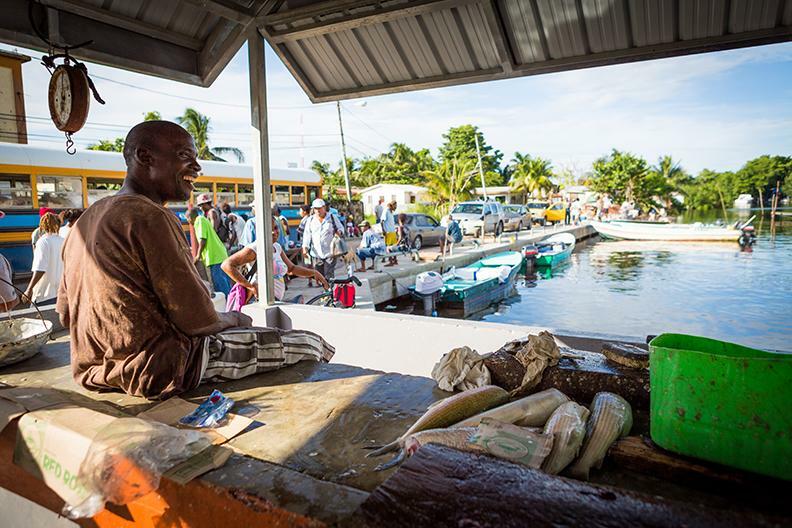 Time spent visiting the fish markets in Belize City each day enabled us to liaise very closely with the fishing community just prior to when the turtle fishery was closed permanently in 2002 by the Belize Fisheries Department. In 2007 we began conducted Point Scan surveys to identify which areas may have more turtle activity and also conducted benthic surveys to identify species composition. In 2008 ex-turtle fishermen assisted in our surveys at Robinson Point using the traditional net capture method they used to employ before 2002 when all sea turtle received protection under the Belize Fishery Regulations. The big difference now is that these same turtles that used to make a living capturing and killing sea turtles, are making a living off protecting and studying them. With the help of these traditional fishermen, we have been able to provide additional evidence on the importance of this area as an adult foraging ground for sea turtles migrating from Mexico, Grand Cayman and Costa Rica where turtles travel upwards of 1500 miles between their nesting beaches in other countries, to their foraging grounds in Belize. A very healthy green turtle captured and released during surveys at Robinson Point. Photo ECOMAR. We learned many things from this study, one being that the traditional turtle nets are not that effective, and that both adult green and hawksbill turtles utilize the area. During the surveys we had one recapture which was a hawksbill turtle (XQ643) that tagged at San Lorenzo, Gulf Coast of Mexico. Linda Searle examining recaptured hawksbill from San Lorenzo, Mexico. Photo ECOMAR.